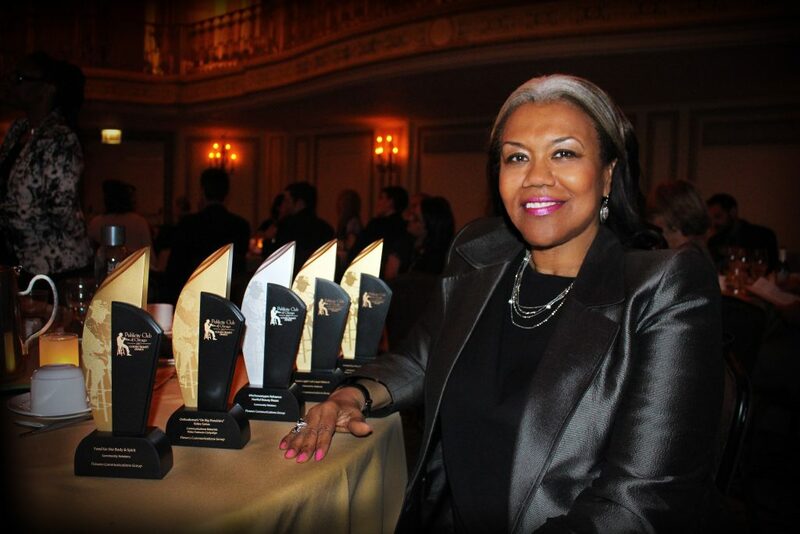 Michelle Flowers Welch is pictured at the 2017 Publicity Club of Chicago Golden Trumpet Awards Dinner. This year, FCG turned 26. When I started the agency, there wasn’t a true focus in the industry on using an integrated marketing strategy that leveraged PR and advertising to reach African American and Latino consumers. To be frank, no one really saw the business case for it at the bigger agencies. Now, in today’s marketplace, companies are more focused on multicultural work, as they realize the $3.6 trillion buying power of these segments combined. Some agencies are doing a better job than others. For me, at the heart of reaching ethnic segments is respect and authenticity. If you don’t have that, then the program or message will fall flat and has the potential to offend. Just look at some of the recent brand fiascos (like those of Pepsi and Shea Moisture). At FCG, we don’t just “do” multicultural, we live it and breathe it. Because it’s in our DNA, we embrace everything that we do with great passion. We’ve created a niche that’s nationally-recognized in the industry based on our ability to reach and respect multicultural consumers. We’ve worked with big brands and companies not just to sell product, but to address key issues in our community such as education, business development, health, housing and financial empowerment. We’ve won more than 100 awards and were just honored with six more – four Gold Trumpets and one Silver Trumpet award from the Publicity Club of Chicago, and a bronze Telly Award for outstanding advertising. FCG is a true pioneer in multicultural marketing. Like other agencies, we’ve had to evolve as our consumers and communications vehicles have evolved. But that’s one of the things I love about this business. We have to stay sharp and up to speed on what’s new and hot to deliver dynamic programs and stellar results. And that means always having top talent because our people always have been – and always will be – what make us great. It’s a joy knowing that I’ve provided a space for the next generation of multicultural marketing communications pros who will go on to make their own marks in this field. That competitive advantage is engrained in everything that we do. So, I invite you to check out our refreshed website to see how we FLOW. Then, connect with us on Facebook, Twitter and Instagram to let us know how you’ve flowed with us over the past 26 years. Maybe you’ve worked with us as a brand partner, community partner, employee or influencer. Tag #FCGFLOW. Here’s to even more years in the FLOW!